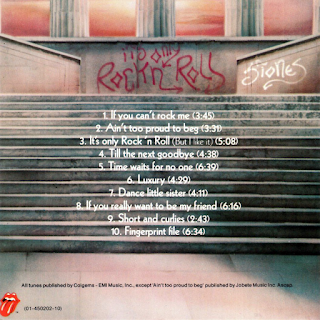 An often underrated album from The Stones. After the critically-lauded "Sticky Fingers" and "Exile On Main Street", 1973's "Goat's Head Soup" began the supposed descent from which The Stones were never to recover, according to many. Another popularly held opinion is that it was something of a "treading water" album with the band at a period of transition. To a certain extent that was true, this is, unfortunately, the last album to feature the wonderfully talented Mick Taylor on guitar. However, in terms of looking for positives about it - the very fact that it includes Taylor is one huge positive. Secondly, while both this and its predecessor suffer from poor sound quality, the sound on here is markedly improved from the muddiness of "Goat's Head Soup". Listening to this album every now and again is always a pleasurable experience. There is some good material there. Starting with the upbeat, rousing "If You Can't Rock Me", with, for a change, Keith Richards soloing on bass guitar. A good start that is continued into the surprisingly good cover of The Temptations' Motown classic from the mid 60s, "Ain't Too Proud To Beg". Motown covers are notoriously difficult, they rarely come close to the originals. This one is not too bad at all. 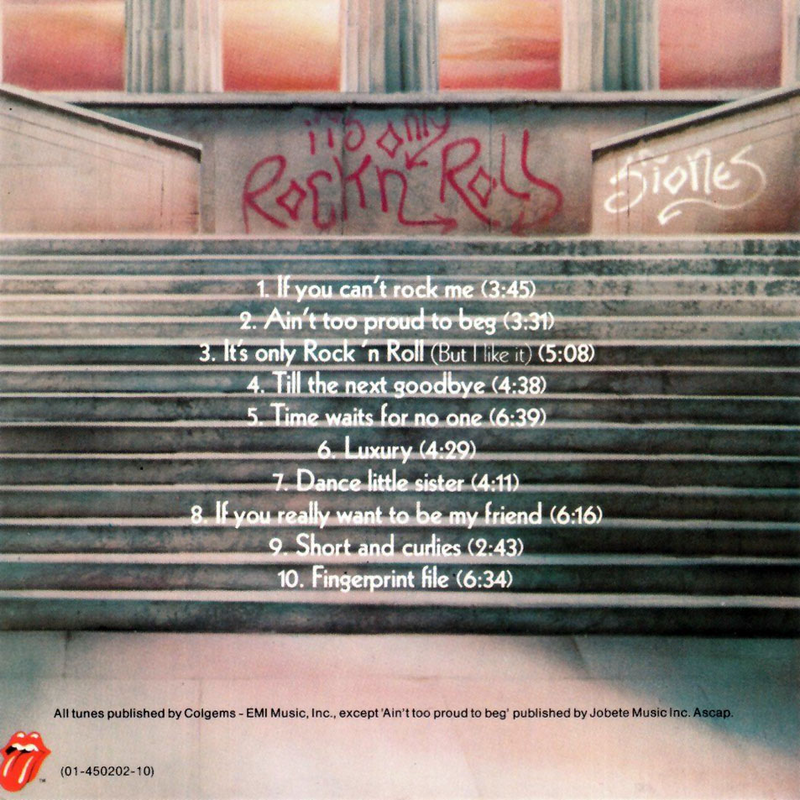 Then there is, of course, the hit single title track, which pretty much became a Stones classic instantly, with its fist-pumping, singalong refrain, recognisable guitar intro and continued excellent guitar parts throughout. "Till The Next Goodbye" is a beautiful, melodic ballad with a touchingly tender Jagger vocal that references his lady's "Louisiana recipes that let you down" at one point (maybe he had a disappointing gumbo) while "Time Waits For No-One" features a stunning Mick Taylor lead guitar that was his last great contribution. It also has an appealing drum rim, piano and bass slow burning intro. The bass continues to be of a quality throughout. Indeed, it is played by Mick Taylor, presumably at a different time to his lead guitar! 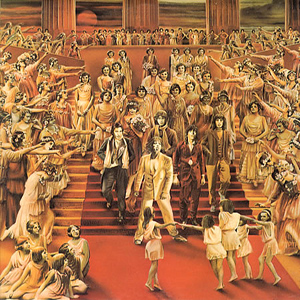 Again, Jagger's vocal here is impressive, vastly improved on his somewhat slurred delivery on "Goat's Head Soup". "Luxury" is a piece of cod-reggae seemingly popular with artists at the time (Elton John's "Jamaica Jerk-Off" and Led Zeppelin's "D'Yer Maker" spring to mind). While it is unconvincing and Jagger's vocal faintly ludicrous, it has a lively, light, summery appeal. It was, at the time, the "album track" that often seemed to get the radio play upon release. I remember it was the first one I heard from the album, played one Saturday morning on the Stuart Henry show on Radio One. "Dance Little Sister Dance" was similarly radio-friendly with its fast paced, drum dominated groove and catchy vocal refrain. "If You Really Want To Be My Friend" was another lengthy, slightly mournful ballad that had echoes of "Waiting On A Friend" from the "Goat's Head" sessions that would eventually appear on 1981's "Tattoo You" compilation of unreleased tracks. Philadelphia soul group Blue Magic (see my review of their debut album) contribute backing vocals. "Short And Curlies" is perhaps aptly short and to the point. "She's got you by the balls" proclaims a miffed Jagger, or "bowwwls" as he enunciates it, typically. "Fingerprint File" is a real high point upon which to end this better than popularly thought to be album. The Stones embrace funk with Billy Preston's keyboards and some wah-wah guitar on this slow-paced, mysterious number about the FBI's surveillance techniques. As it fades out among whispers and a descending, disappearing beat at the end, we hear the fading out of the classic end of the 60s/early 70s Stones line up. Maybe it is this, not "Exile" that sees the last of the truly credible Stones material.